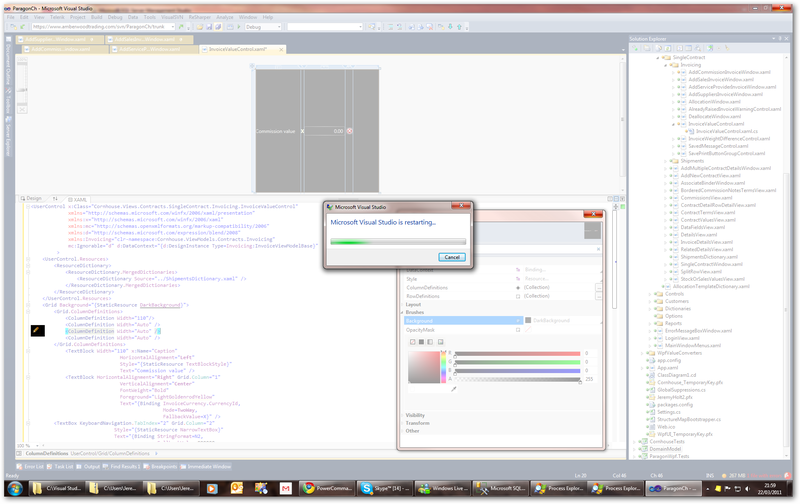 After about 10 minutes VS 2010 with the latest build crashes to the desktop. If I uninstall it and put on 5.1.3 I have no problems. I've got the log file - could you please let me have an email address I can send it to? Please send the logs to me (andrew dot serebryansky at jetbrains dot com). lead to the crash? Thank you! desktop. If I uninstall it and put on 5.1.3 I have no problems. I can send it to? Just to let you know - I installed 2011. I've been running it for about two hours and no crashes to the desktop. It still "freezes" intermittently though. It was working fine for about 4 hours and then started crashing to the desktop again. that led to the crash? Thank you! I reformatted my disk, and did a fresh installation of VS 2010 + SP1. I then installed the Productivity Power Tools extension. It ran perfectly well for about 10 hours. I then tried to change an option on Productivity Power Tools - to remove the NavigationWindow. Tried to open VS and crashed at loading. I uninstalled Resharper EAP, and VS loads as usual. I'm guessing that's its a problem with Productivity Power Tools- but there is no trace of Productivity Power Tools left on my machine, yet there is no way that I can get the EAP to run. I can repro this also. I was a build within the past week and upgraded to 2116 last night on 2 different boxes. Both instances of VS crash on startup on both boxes now. If I uninstall the EAP then VS works fine. On one box I did try 2115 and had the same behavior. I tried disabling all extensions but that did not help. I have not uninstalled the extensions (I do have the Productivity Tools installed). My dev team has 2116 running on boxes on a closed network with the same extensions and we are not experiencing any crashes. I've had to unistall the EAP from my main desktop machine. But its running fine on my notebook which has exactly the same extensions installed. we'll write back as soon as we can. Thank you! I skipped the last few builds having gone back to 5.1.3. I just installed Build 6.0.2119.39 and VS started up with no crashes! Not only that but everything feels about 20 times faster! Mind you Ctl-X (Cut) is still fairly slow. I'm experiencing the same issue on VS 2010 startup (Faulting module path: C:\Windows\Microsoft.NET\Framework\v4.0.30319\nlssorting.dll). I'm currently on build 2119. I have two Win 7 x64 machines and the problem exists on both. It started one or two builds before that. On one, I had to uninstall R# to get VS 2010 to start up successfully. On the other, it will start intermittently. VS2010 crashes to the desktop immediately after starting up. attach it here? Thank you! I uninstalled/re-installed 2121 a couple of times lastnight, and VS2010 crashed each time. I restarted my computer this morning, and installed 2121 again. This time it works. I had uninstalled R# 6 yesterday so that I could continue working. I installed build 2122 this morning and now it is not crashing. If it starts occurring again on either of my machines, I'll create the minidump and send it to you. I had this error for the past week. Mainly on Win 7 x64, but have also seen it happen on WinXP at work. Usually nlssorting.dll is the mentioned module, tho I've also seen clr.dll at times. After multiple tries, when even rebooting between installs didn't work, after uninstalling I had to delete all Jetbrains folders in Program Files (x86) and under my user's AppData folders. Clears all settings I assume, but now VS.NET doesn't crash on startup. Going to reinstall my extensions and addins now as well; I had tried removing all of them originally thinking there may be a conflict. But that alone didn't fix it. Note this happened sometime after build 2116 I believe. Sorry I didn't get a WinDbg output on it either. For whatever it's worth, I was running arecent version (2119 I think), and I did not have this problem. But I had another problem that required me to use the VS Command Prompt. Did you know that the VS Command Prompt depends on C++? It does. So I added C++ via the VS Installer. After that VS crashes at startup every time. I installed the latest (2123) and same thing. I have completely uninstalled R#, and no more crashing. Of course VS running without R# is only slightly bettter than it totally crashing. Hopefully a fix is coming! I encountered the error today and attached WinDbg to VS 2010 as it was starting up. This is the first time I've used WinDbg so I'm not really sure what I'm doing. However, I saved the output from WinDbg and created two mini-dumps using ProcessExplorer - 2 because there were two instances of VS 2010 running but I think one of them was being used by WinDbg. I've created a 7-zip file with the WinDbg output and minidump and attempted to attached it to this post but I'm encountering a "request to large" error, even though the 7z file is only 10MB. How shall I get it to you? Attached is the WinDbg output. I still can't get the minidump to upload. This is happening again for me in build 2133. VS2010 immediately crashes after starting up. I'm installing WinDbg now, but it looks like it's going to take a while. Update: I installed 2134 this morning, and it's working fine so far. I was using build 2134 all day w/o problems. I decide to restart VS 2010 because it was slowing down. Then when I attempted to start VS 2010 again, I started encountering the crash again. I might be crazy but there's been several times when it works throughout the day and then in the evening it crashes. Could it be related to the time of day? Doesn't make sense to me but that's one observation I've made. I still have the WinDbg reports, if those are helpful. I've not heard from anyone since offering those. I'm having the same problem with build 2135. Is there anything I can do to help with this issue? The same exact build works on a separate machine, but does not work on my laptop. If the value is True, VS2010 crashes to the desktop every time. If you set it to False, it doesn't. I found this by noticing that VS2010 didn't crash under another account even with the same plugins installed. Renaming the %APPDATA% ReSharper directories caused ReSharper to recreate the contents and VS didn't crash. I then copied files over until VS crashed. Deleting UserSettings.xml and launching VS2010 causes ReSharper to recreate the settings. A diff followed by copying differences one-by-one isolated the setting that caused the crash.